Imagine you could present to your visitors vast amounts of the most complex information that you cared most about, in all its subtlety and depth. Imagine you could stage your presentation in such an elegant and engaging way that your visitors would be able to grasp the overview right away and then, by themselves, explore and experience cascades of text, pictures, and sound that make up your subject matter to whatever depth they chose. The Interactive Digital Wall is an ideal display for chronological information, for executive briefings, and for putting a "magic lens" onto otherwise static material. The combination of a bold printed background (or vitrenes containing artifacts) with a glowing user-movable high resolution LCD display is an irresistible draw to visitors of all ages. The dynamic and progressively revealed content allows you to include a very large amount of information in a small space. In the executive briefing tools above, the Interactive Digital Wall is ideally suited for the presentation of linear spatialized information, such as signal flow, project paths, and topographies. 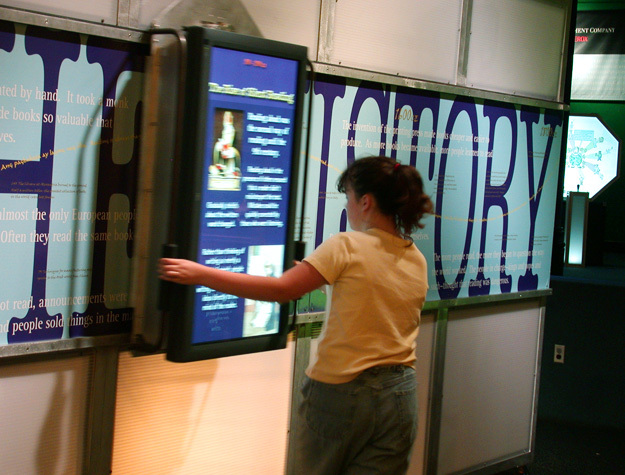 The Interactive Digital Wall can create dynamic timelines and interactive histories. As an attractor device, the Interactive Digital Wall is easy to use for most people and is especially appealing to children. As viewers move the flat monitor along its track, they become quickly captivated by the content. The moving wall is ideal for communicating complex timeline histories with or without an accompanying docent. The moving display can amplifiy and magnify details of static printed information, or display alternate, animated information. Even walls with large displays move smoothly and easily enough to be operated by young children. Safety brakes automatically slow the motion of the carriage if pushed too quickly. Innovative uses of the background can enhance the visitor experience. Shown below, a 4-meter long wall depicting the History of Science was recently constructed and installed at the Singapore Science Centre. Graphic "bubbles" that break out of the frame of the wall add to the sense that the path to scientific discovery often takes twists and turns. Among the 10 episodes describing classic scientific discoveries were included 9 "Interludes" that described historical situations where science did not follow the straight and logical path we normally associate with progress. Another way the Interactive Digital Wall is being used is as a Magic Lens onto background material, much like children's shows used to use to peer into objects and see a cartoon about the underlying structure. Currently under development is a wall that recognizes "hot spots" on a cityscape background and displays an animated scenario based on the spot over which the visitor has moved the display. Onomy Labs quickly incorporates new advances in technology into their products. For the current wall design, we have adopted the newest high resolution LCD flat panel displays, and have incorporated dynamic braking, motorized movement, an on-board computer, and new sensor technology. We are developing a 2-dimensional movement and curved track and remote control. Each wall can be finished in a variety of styles and colors to suit your decor.